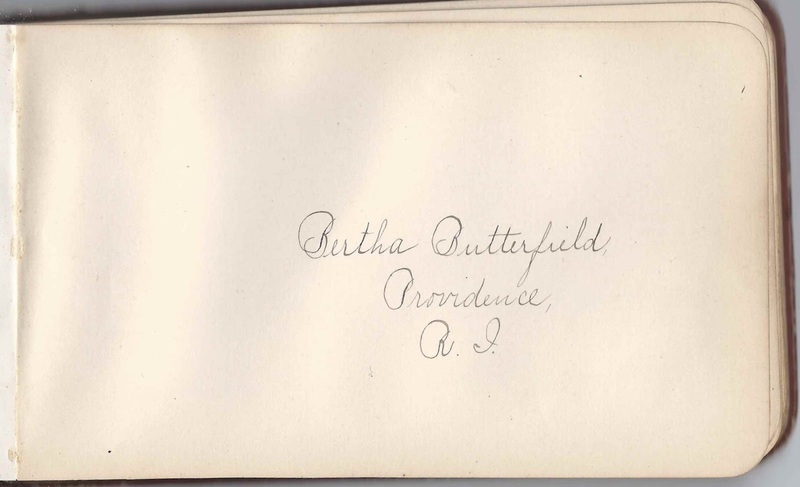 Note of April 27, 2014: Please check the comments section as a reader has provided more information on Bertha Butterfield and her family, including the fact that she married one of the signers in her album, Will H. Mixer of Providence, Rhode Island. 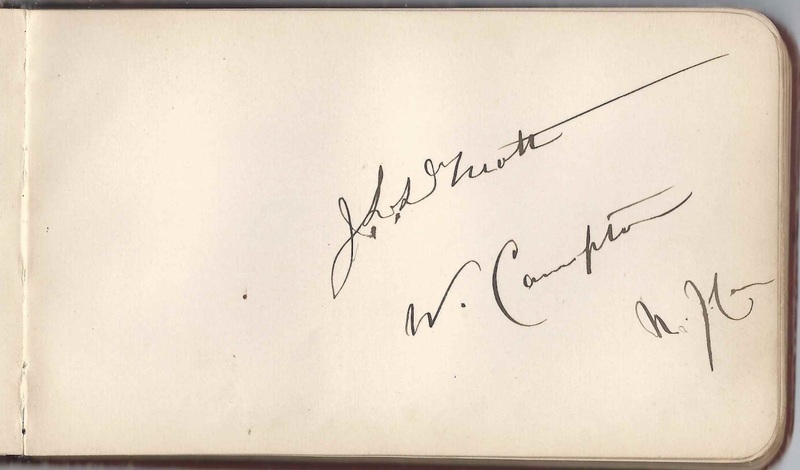 1884-1893 autograph album that belonged to Bertha Butterfield who indicated in the album that her residence was Providence, Rhode Island, but the family had also lived at Meredith, New Hampshire. There are autographs from both areas. 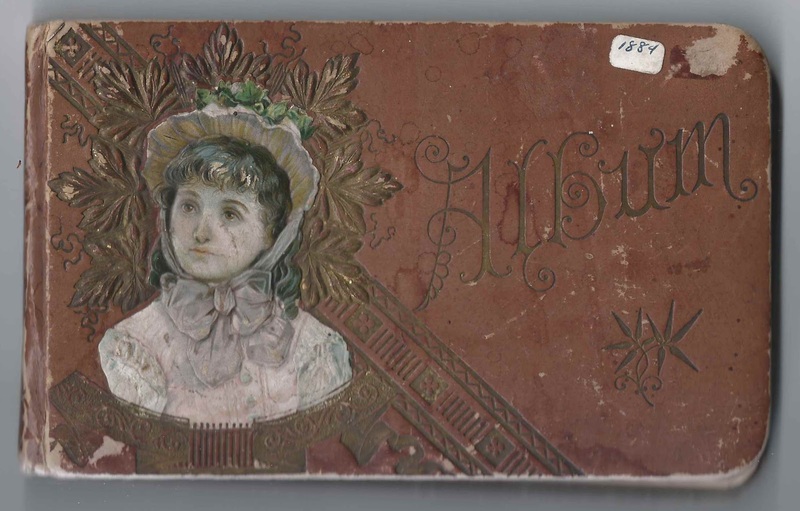 The album is approximately 7" x 4-1/4" and contains the sentiments of 36 of Bertha's friends, schoolmates, teacher and aunt. An alphabetical list of the signers appears at the end of this post. Bertha Butterfield was born about 1874 in Pennsylvania, the daughter of Isaac and Martha Butterfield, who were born about 1850, in New York and Pennsylvania, respectively. 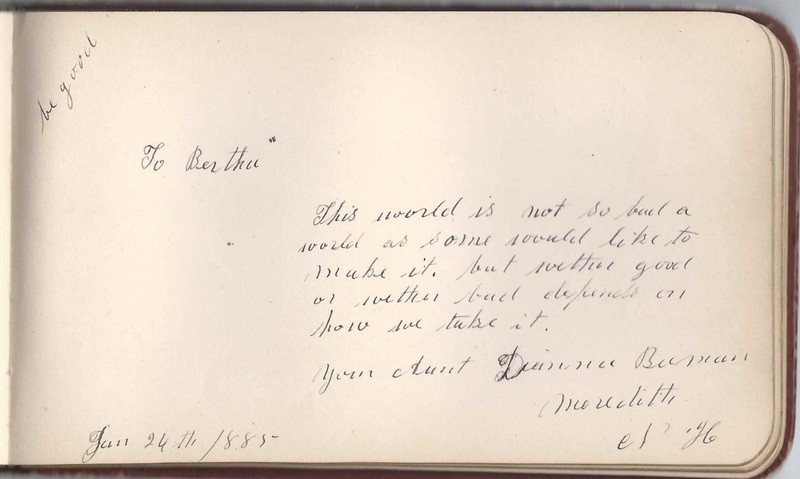 The 1880 Federal Census found the family living at Meredith, New Hampshire; Isaac was listed as a machinist. There's a Find-a-Grave listing for an Isaac Butterfield at the Locust Grove Cemetery at Providence, Rhode Island. He was born 12 November 1849 and died 30 June 1898. There are no other Butterfields buried at this cemetery, according to the listing. Whether this Isaac is Bertha's father or not, I don't know, but it's interesting that the Isaac Butterfield who's listed in 1890s city directories of Providence, Rhode Island, is also a machinist. One signer indicated that she was Bertha's aunt. I think her name was Dianna Beeman of Meredith, New Hampshire, signed on January 24, 1885. Whether Dianna was a blood relative, an in-law or someone who felt close to Bertha, I don't know. If you can add details to the lives of Isaac and Martha Butterfield and their daughter Bertha, please leave a comment or contact me directly. Thanks! 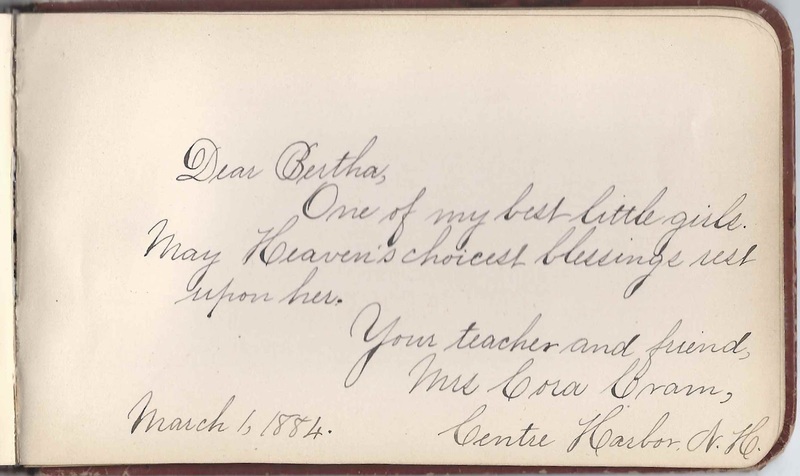 Bertha's teacher, Mrs. Cora Cram of Centre Harbor, New Hampshire, signed a page on March 1, 1884. I couldn't make out the name of one signer. If you can make a determination, or even a guess, please let me know. 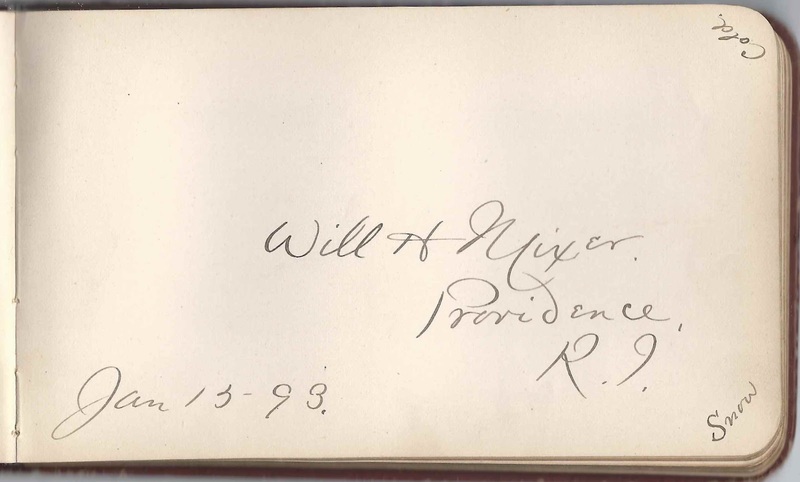 Will H. Mixer of Providence, Rhode Island, signed on January 15, 1893; he would marry Bertha Butterfield about five weeks later. Thanks for the excuse to get some more practice in RI records. 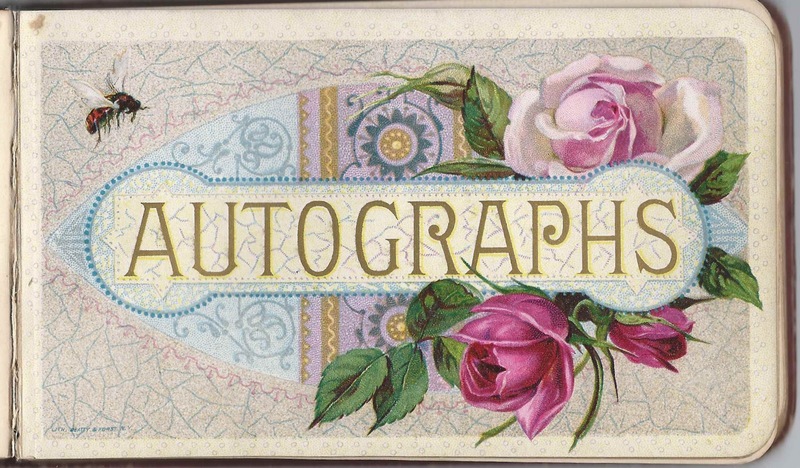 Bertha married autograph book signer Will H. Mixer of Providence, Rhode Island, five weeks after he signed her book on January 15, 1893. They had two children, neither of whom had children. Bertha Butterfield Mixer is listed as the mother of Alice Lucille Mixer, born 30 May 1898, Providence and Pauline Violet Mixer, born and died 19 Jul 1904, Providence. She is also listed as the spouse of William Henry Mixer who died 8 Oct 1950, Providence. from ancestry.com, Alice L Mixer, age 41, was single and living with her parents in 1940 on Carolina Ave, Providence. All four: Lucille, William, Bertha (d 1950) and Alice (d 25 Apr 1984) are buried in the same cemetery as Bertha's father, Pine Grove Cemetery, Providence. Martha J Butterfield, born 4 Dec 1855, widowed, a housekeeper at 115 Waverly, Providence Born in Pennsylvania, parents also. Had resided in RI for 20 years. The only "Martha J" born in Pennsylvania who is iving in Rhode Island in 1910 is a Martha J Marshall, age 55, widowed, born in Pennsylvania, one child, one living. A woman by that name died in Philadelphia 10 Oct 1918. Her death record says her parents were Samuel Custard and Sarah Slutter. In 1870 in Stroud, Monroe County, PA, there was an Isaac Butterfield, 19, born in NY, boarding with an Abijah and Bertha Wallace family. four households down is Martha J Custard, 20, daughter of Samuel and Sarah Custard. I don't know if this is her for sure, but ... . The RI Historical Cemeteries are pretty complete and she isn't there, as you found out. Isaac and all four Mixers are in the same cemetery but not Martha.